Last week I ran an innovation breakfast for fundraising leaders with the creative team from Sandbox. One of the key discussion points was that in order to innovate well, organisations and individuals would need to take a new approach to failure. In fact, failure must be actively encouraged in order to learn, and ultimately achieve greater success. One of my favourite (?!) failure stories is from Coca-Cola. In 1985 in response to its declining market share and the increasing popularity of its key rival Pepsi, Coca-Cola launched New Coke. At the time Pepsi’s advertising campaigns were based around asking the public if they could taste the difference between Pepsi and Coke. They could – and they preferred the taste of Pepsi. In response Coke developed a new sweeter tasting formula. After conducting over 200.000 taste tests, which according to the taste testers not only tasted better than the old Coke, but also tasted better than Pepsi, New Coke was ready for launch. However on 23 April 1985 when New Coke was launched and old Coke was taken out of circulation it was a disaster. Customers were horrified that their Coke had been changed. Some people likened the change in Coke to trampling the American flag. A black market for old Coke emerged, at a market value of $30 a case. 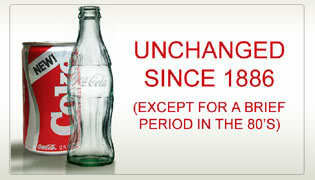 On July 11, Coca-Cola withdrew New Coke and reinstated old Coke. “We did not understand the deep emotions of so many of our customers for Coca-Cola,” said company President Donald R. Keough. If you tell the world you have the ‘real thing’ you cannot then just come up with a ‘new real thing’. To make matters worse, since 1982, Coke’s strap line had been ‘Coke is it’. Now it was telling customers that actually coke wasn’t it, but New Coke was now it instead. Coca-Cola were fighting a taste battle with Pepsi in response to Pepsi’s marketing campaign. What Coca-cola overlooked was that the battle was not about taste, and they underestimated the value of brand loyalty and the heritage of Coca-Cola. Ironically, through the brand failure of New Coke, loyalty to ‘the real thing’ intensified and Coke recovered its market position with old Coke, repositioned as Coke Classic. Some conspiracy theorists say the whole campaign had been planned order to reaffirm public loyalty for Coca-Cola. But whether it was planned or not, the fail of New Coke affirmed the value of the brand and with that insight Coke went onto retake its leading market position. Learning important insights from its failure was key to Coca-Colas reclaimed success over Pepsi. So what if organisations and individuals actively encouraged failure in order to gain insight and ultimately achieve greater success? What would it look like? What would our leaders, managers, fundraisers, volunteers and supporters need to do to really make failing part of ‘how we do things round here?’ How do we make failure an important part of the organisational culture and an important part of greater success? Answers on a postcard please or to @lucyinnovation. This entry was posted in Coca-cola, customer service, failure, fundraising, ideas, Innovation, insight, leadership, marketing, passion, Sandbox, SOFII - Showcase of Fundraising Innovation and Inspiration and tagged 1985, audience, BFI, brand, business, coca-cola, coke, complaints, creative, customers, failure, insight, learn, loyalty, New Coke, Pepsi, Sandbox, stories, success. Bookmark the permalink.